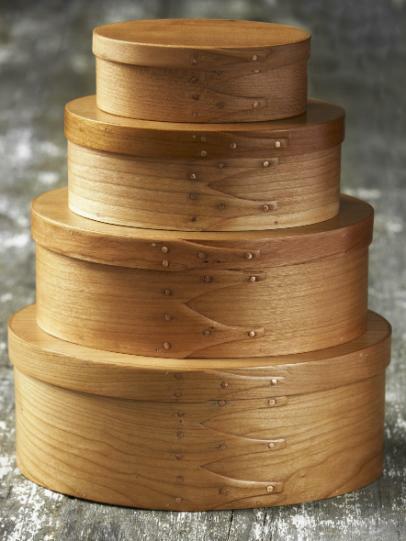 These beautiful boxes are perhaps the most iconic and easily recognised of all Shaker designs. 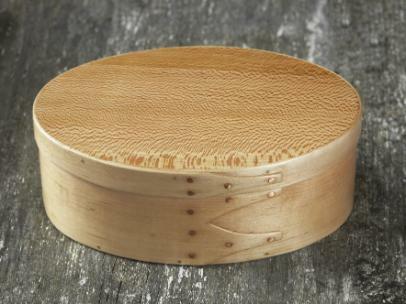 First made over two hundred years ago as food storage containers, they quickly became a must-have item in many American kitchens, and were sold by the Shaker community throughout the USA in stacking sets of four or more. They were the Tupperware of their day: strong, light, and insect-proof. Early boxes were often painted in different colours on the outside - but never inside. Bigger boxes were used for sewing and other practical purposes around the house. The design was also used to make baskets or carriers for use in the garden and orchards. Once the design was established it was never changed, as the Shakers believed in leaving a good design alone. Although no longer used to store food in the kitchen, Shaker boxes are still in great demand as beautiful objects in themselves. The baskets make wonderful table displays filled with fruit, and the boxes are sought after as jewellery boxes, sewing boxes, etc. The smaller boxes are great for earrings, cufflinks and so on - but most of all they are just good to look at.